One Burning Man Ticket and Ultimate Manifesting Guidance Package. ::Complete with manifesting tools, guidance and creative healing council to achieve the most from your voyage HOME. Prep your Playa Experience while you pack, our council will stay with you through the Playa and back into integration in the months that follow. If you are a virgin or seasoned burner try THIS BURN with the magic and council of Two Playa goddesses - an oracle and a healer - both offer their services to ensure you end your playa adventure as your very highest, and optimal self , for creating and evolving your future. A huge part of Burning Man is about transition and transformation. Intention and manifestation is KEY. Echo Bliss and Phoenix are experienced Burners who regularly help people into a better place both on and off the Playa. This Burning Man ticket will enable you to enter the sacred playa with clear intent and next level magic. How will you know you are experiencing your optimal or are manifesting from your highest-available self? Phoenix is a fabulous healer who uses energy, belief work, shamanic practices and channeling to clear you of everything failing to serve you and keep you in that high vibrating space of clear and masterful manifestation. She can see what is ailing you, whether its mind, body and/or soul, and resolve it with you as she explains what brought it on and helps you shift it. She will help you get out of your own way and annihilate limiting beliefs. She will bring you into your highest possible self and identify how to keep on that path. You are going to feel better than you thought possible. Echo is an amazing Oracle who will see where you are now and where you are headed. If you want something different, she can tell you if its possible and how to get there. If its not possible, shell discuss whats in the way and provide you with options to shift your life. She can see everything you need and want to see, and can answer questions you never realized you had. She will set you up for the most magical experience to follow your journey and help you integrate all you found into your default life. Are you ready to let burning man change the trajectory of your lifes calling and your impact on the world? Then this ticket is for you. The value of 6 hours of one on one time with two life transforming healing facilitators is priceless! We suggest you have a reading/healing with each of us before Burning Man, shortly afterwards, and then a few months later. Youll be amazed how much your life will change. You may arrange for continued work and support from each or both of us after the six session Package is complete. If you are ready for THE MOST POWERFUL AND LIFE ALTARING Burning Man experience, youll want this ticket package. 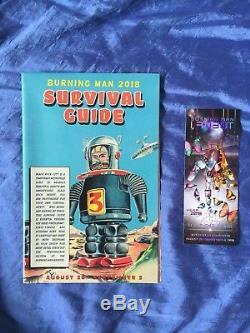 The item "One Burning Man Ticket 2018 & Complete Manifesting Magic Guide" is in sale since Tuesday, August 7, 2018. This item is in the category "Tickets & Experiences\Other Tickets & Experiences". The seller is "echoslocation1" and is located in Elroy, Wisconsin.